Like the best things in life Cinénova Grande BR is created with love for detail, passion for strength and respect for grace. Cinénova Grande BR conveys audio without interpretation, coloring or compression - True to life. 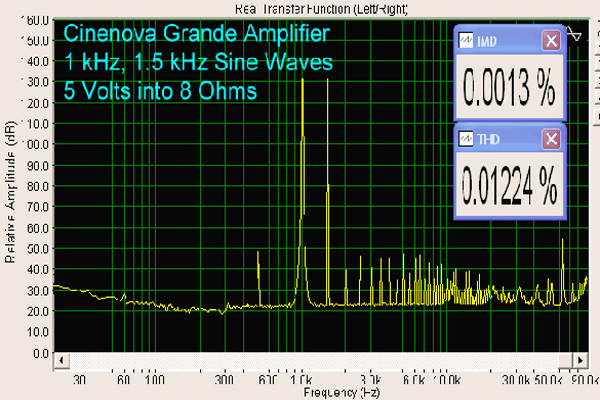 Cinénova Grande BRis comprised of individual amplifier blocks named Alpha One. The Alpha One module blocks work independently of each other – each is a 1000 watt power amplifier itself. Each Alpha One has a 15 amperes supply and is equipped with its own preamplifier and power supply circuits (electrolytes, rectifier, etc.). Alpha One is equipped with 10 ultra-fast, 30 amperes special Toshiba transistors. This armament allows 1000 watts continuous power and 2000 watts transient response. It has previously been difficult to construct a powerful amplifier that is both quick and articulate as powerful amplifiers typically mean a longer and more complex signal path. 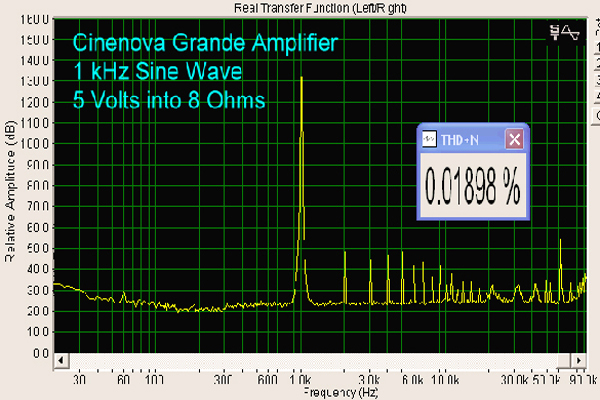 The new transistors help to transcend traditional barriers and effortlessly reproduce source material to over 100kHz. The combination of speed, high-power and ability to handle high voltage swings ensures the Alpha One meets its specifications effortlessly. Each Alpha One has a combined transistor current rating of 300 amperes. In addition, a 180 volt DC high voltage supply with an electrolyte bank of over 45 Joules of pure energy guarantees headroom at all times. Cinénova Grandes ability to control a large and heavy sub-woofer cone is unmatched even when compared to exotic 2 channel designs. A damping factor of more than 1,600 means that even large and heavy speakers are dominated with ease. Even the most complex low frequency material is reproduced with dynamic punch and rock-hard control. "Just when I thought I've heard it all, the Cinenova Grande came along"
The transformer is further unique in its symmetrical parallel structure. This means that each power amplifier block has its own secondary winding. It isolates the individual blocks and makes them independent from each others power supply. At the same time making every module blocks secondary winding magnetically coupled to the one large primary winding. This results in a supply stability and stiffness unknown in amplifiers based on several small transformers. The above specified design results in a power supply with a regulation factor of less than 3% at full power. Transformer winding and a special hard coating results in hum free operation. This is further ensured by 10 layers of pressed foam of different density used as insulator. 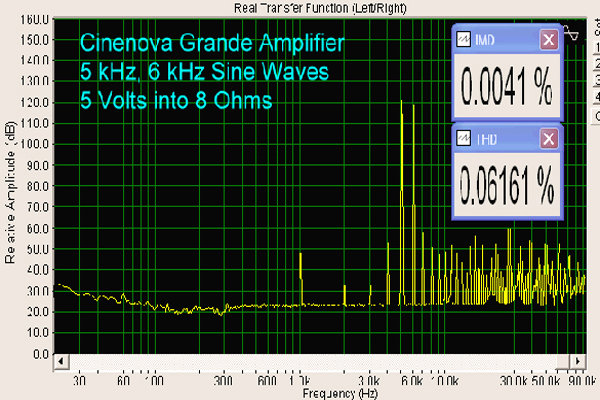 "This amp possesses that rare ability to tear through the densest, most complicated material with incredible punch, power and control"
These noise sources have no influence on Cinénova Grandes performance. The exclusive power conditioner eliminates the need for expensive external power conditioners and related accessories. The benefit of this is that the usage and intensity of use is no longer a factor for the amplifier's durability and longevity. To achieve an extremely low resistance and preserve signal integrity the traces on the circuit board are of the 3 ounce oxygen-free copper type. "This amp brings new meaning to the phrase "gentle giant"." exponentially as the air velocity increases for each centimeter of vertical ascending convection. The same heat sink surface area with half the height would have a greatly reduced cooling capacity. The Cinenova will keep cool even with the hardest and most rigorous use. "Massive, wide-open soundstage, and it refused to constrict even the smallest of nuances"
Cinénova Grande is equipped with instrumentation on the front of the amplifier which informs the user about the status of each channel. An orange LED for each channel will light up when the channel's output is within a 1 dB of full power. This is signaled by the LED briefly lighting up (flashes) by transients in the music / movie. 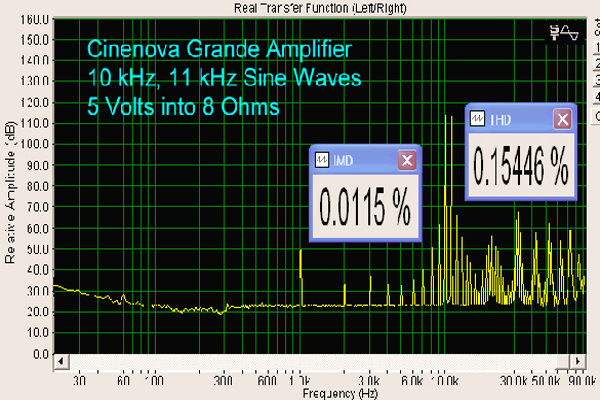 The signal is still amplified distortion-free and one should be careful not to increase volume. This information enables the user to utilize all the amplifier's power resources without concern for unpleasant and harmful loudspeaker distortion. It is also an invaluable feature for users who are experimenting with bi-amping and want control over the spectrum each speaker part sees. Many will find it useful to cut off frequencies below the tuning point on the user's speakers. Added power below this point can not be reproduced by the speakers and thus constitutes an undue burden. There is often a noticeable sound enhancement benefit by cutting off the low frequencies a small speaker can not handle. Increased dynamics, detail and power handling are typical areas that will be improved. "Besides the massive raw power that delivered a smooth upper range, the bass was extremely tight"
"A potent combination of speed, grace and power"
Traditionally, RCA and XLR inputs are mounted parallel to the same signal path and both inputs are active all the time. That means using the XLR inputs the RCA input acts as a small outdoor antenna and adds noise to the signal path. Cinénova Grande has a switch which disconnects the unused input.This ensures a closed signal path free from extraneous noise which is essential for a true balanced design to operate optimally. We hope that the above introduction to the Cinénova Grandes universe has inspired you. 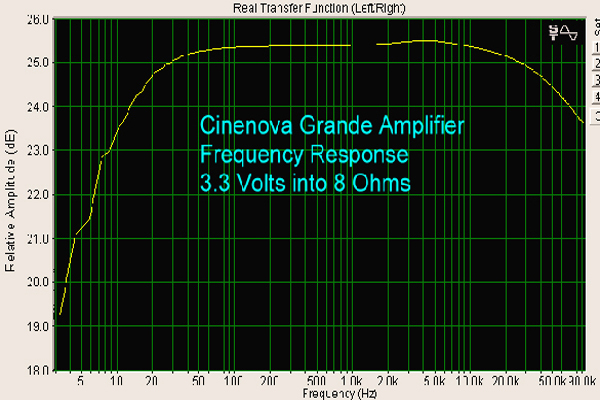 It is our belief that Cinénova Grande is one of the world's best power amplifiers, regardless of price. Below are some examples of Cinénova Grandes competent performance.